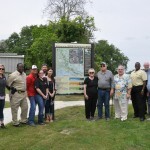 More Informational Kiosks Installed on Bayou Teche and the Lower Atchafalaya River! Unveiling ceremonies for the Franklin and Patterson Kiosks took place on April 10th and April 12th! David Dahlquist with the TECHE Project has been working hard to install these beautiful informational kiosks along the bayou. To date, there are 4 kiosks installed in Port Barre, Breaux Bridge, Franklin and Patterson. Work on kiosks in Parks, St. Martinville, and Charenton is underway. Special thanks go out to all of the sponsors who have helped make this project a reality! 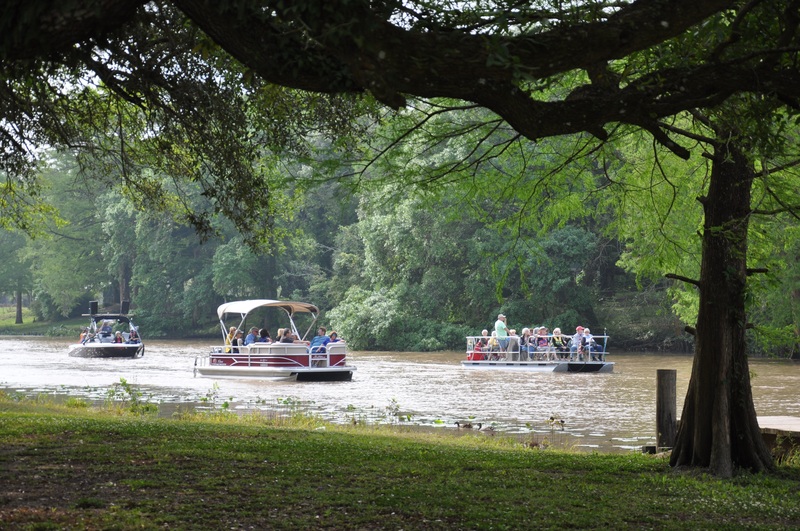 The TECHE Project was honored to have hosted boat tours for more than 60 ticketholders of the annual Books Along the Teche Literary Festival in New Iberia on Sunday, April 7, 2019. Tour participants came from Germany, many states around the country, and our local area. As he has provided in previous years, Dane Thibodeaux, a TECHE Project Council member of Breaux Bridge narrated three 1 ½ hour tours with his knowledge and creativity about some of the local authentic sites which American author James Lee Burke highlights in his 22 novels featuring detective Dave Robicheaux. The numbers of passengers for this year’s Festival boat tours tripled over that of previous years. The tours would not have been possible without the generous donation of time, boats and fuel provided by Captain Jude Desormeaux, Mike Parich Jr., and Craig Brodie. And high appreciation goes to the Festival volunteers who helped with all aspects of the Bayou Teche boat tour event. Chris Wiley Wins the Bayou Teche Category in the Plein Air Art Competition! March 15, 2019, New Iberia, LA – The TECHE Project awarded the first-place prize of $1,000 to a beckoning painting of the Bayou Teche created by Chis Willey in this week’s Shadows-on-the-Teche Plein Air Competition. Her painting features the Teche with natural and beautiful lighting and color affects. 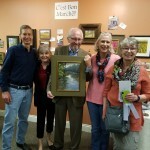 The award was presented at the standing-room-only Friday evening Awards Ceremony and Fine Art Sale held at the Shadows Visitor Center. The fifth annual Shadows-on-the-Teche Plein Air Competition included nearly 30 artists selected among a record number of 73 applicants from 19 states. During the Plein Art week, artists paint on-site landscape and townscape scenes from around Iberia and surrounding parishes. The winning artist for the scene from the Bayou Teche, Chris (Christina) Willey, has an MFA in Illustration from Syracuse University and a BFA in Drawing/Painting from the University of Nebraska-Lincoln. She is a full-time painter and Professor Emeritus of Art from the University of Central Missouri, where she taught for 22 years. Willey has had numerous solo shows and conducted workshops in United States, France, and the Netherlands. She has acquired signature status in the Missouri Valley Impressionist Society, MidAmerica Pastel Society, and the International Society of Acrylic Painters. She has won over 60 awards in many international, national and regional juried shows, including several Best of Show and Gold. She has been juried into Plein Air events around the country including Telluride, CO; Rockport, TX; and Mountain, Maryland. Her art is held in several private and corporate collections in the U.S., Netherlands, and France. Visit her website at www.chriswilley.com. 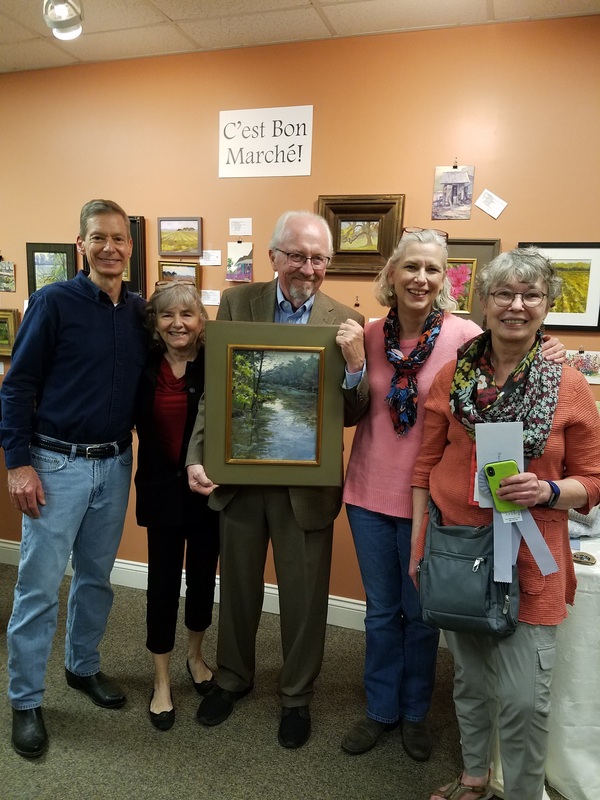 The first-time $1,000 prize for the best painting of the Bayou Teche is presented by The TECHE Project with generous contributions by Margaret and Jeff Simon along with Mary Ubiñas-Dahlquist and David Dahlquist. The jurors for this painting category—Conni Castille, Paul Schexnayder, and David Dahlquist–reviewed over 20 paintings of the Teche in selecting the original work created by Chris Willey for first place. The TECHE Project has partnered with the Shadows-on-the-Teche Plein Air Painting Competition to recognize the Bayou Teche as an amazing source of inspiration and scenery for highly accomplished painters from around the United States. The Plein Competition takes place March 9 through 15. Throughout competition week, artists paint throughout seven parishes in the Acadiana region that includes a variety of viewscapes and a special painting category for scenes of the Bayou Teche has been added for this year’s competition. 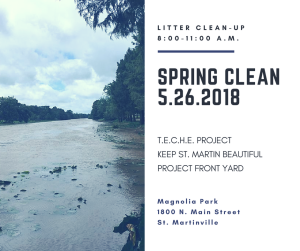 The TECHE Project; Margaret and Jeff Simon; and Mary Ubinas-Dahlquist and David Dahlquist will award a $1,000 first place award for the winning Bayou Teche painting. The public awards ceremony and fine arts sale will occur Friday, March 15, 2019, 6:30PM at The Shadows Visitor Center, 320 E. Main Street, New Iberia, LA. The event is free and open to the public. Check out www.shadowsontheteche.org/public-plein-air-events for more information. Each year, in conjunction with our Annual Membership Banquet, we issue the annual report summarizing our efforts for the previous year. 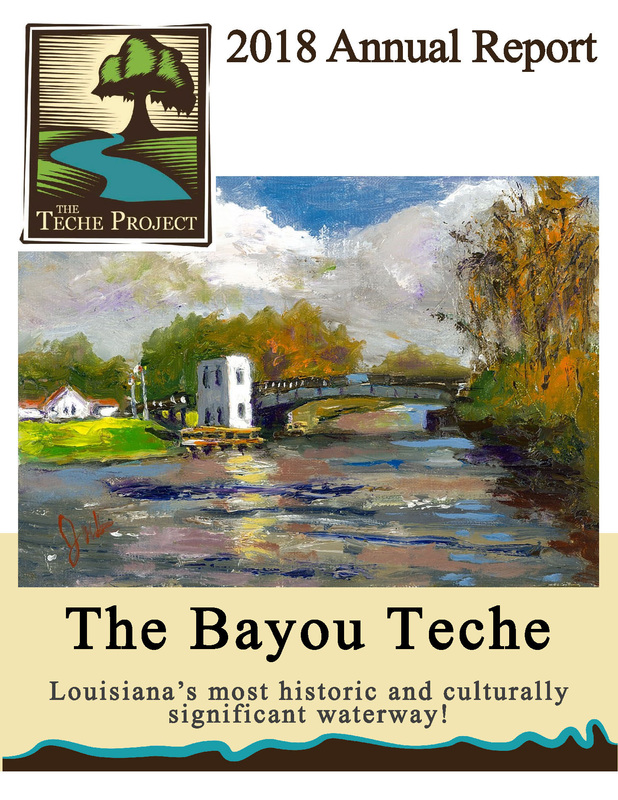 Click here to download and review the 2018 The TECHE Project Annual Report. The tenth year of The TECHE Project witnessed significant growth in our programs, funding support, memberships and partnerships! We look forward to an even more promising 2019! Please join us on February 2nd from 6 pm to 9 pm at the Little Flower Auditorium in Arnaudville (102 Pine St.) for our Annual Membership Banquet. Doors open at 5:30, and you don’t have to be a member to attend. There will be a $20 membership fee for those who are not currently members. The banquet will have live music, dinner, libations, and a guest speaker (David Walther with the U.S. Fish and Wildlife Service) discussing the Mississippi Rivers and Tributaries Corps Project and how water is moved from this mighty river through the Athafalaya River and into the Teche-Vermilion watershed. 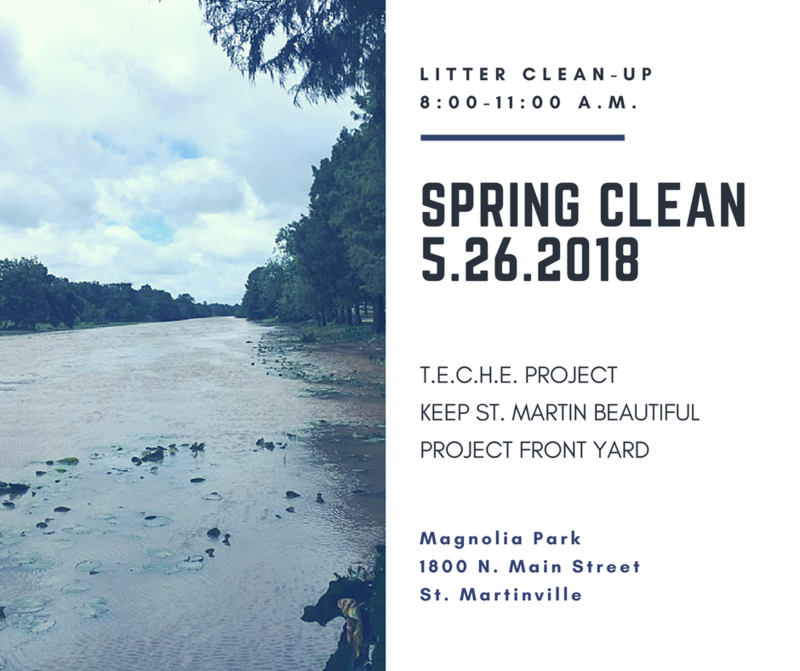 There will also be a silent auction to raise funds for the TECHE Project’s mission to create a Bayou Teche Renaissance through raising awareness of the ecological, recreational and cultural values of the Bayou Teche Corridor. Also, as part of the banquet, there will be an free afternoon guided tour of the Teche-Vermilion Fres Water District Pumping Station in Krotz Springs! This amazing tour is available through registration only and is limited to 30 people, so please contact Patti Holland (337-277-4645) howldogfarms@gmail.com to register before the end of the day on January 27th. Transportation from the Little Flower auditorium will be provided by the Tech-Vermilion Fresh Water District at 3:30 and you will be delivered back to the event location at 5:30 in time for the banquet. We hope you can make it to this entertaining and informative event! Paddle to the Party – The paddle trip is currently scheduled for 10 to 12 from Poche Bridge to the festival grounds at Parc des Pontes (St. Bernard School). You do not need to register as this is a free event. The TECHE Project will have a tip bucket if you feel inclined to share your love for what we are doing on the bayou. Please bring a life vest and plan to be at Poches by 9:30 to check in and hear the safety briefing. We have a shuttle bus that will leave from the festival at 9 am. You can drop off boats at Poches Country Club, send driver to the Festival grounds to park car behind Cemetery and jump on the shuttle by the boat launch. Shuttle cost is $5, but well worth the price because your vehicle will be waiting to load up after the float trip! If you want to rent a boat for this event, Contact Bayou Teche Experience. Rain Contingencies – The weather is up in the air (Our powers are combining to make the rain go away), but not to worry cause the party will go on rain or shine! The nice folks at St. Bernard School have offered us the use of the covered pavilion and gymnasium, so come out to pass a good time and show your support, especially if it rains. If it looks like only rain in the morning, we may delay the float trip. We will keep you posted on that. 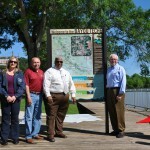 More Towns and Cities on the Teche will have new paddling docks and launches. 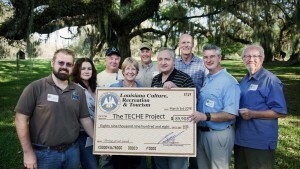 Franklin, LA, March 3, 2018: The TECHE Project has been awarded an $89,908 Federal grant through the Recreational Trails Program (RTP) for the installation of new canoe/kayak docks/launches in towns and cities along Bayou Teche from Port Barre all the way to Berwick. Michael W. Domingue, who administers RTP for Louisiana within the Department of Culture, Recreation and Tourism under Lt. Governor Billy Nungesser, made the announcement at Oaklawn Manor near Franklin, LA before a group of approximately 100 supporters of this important waterway. RTP is a Federal program drawing funding from taxes levied on fuel sales for recreational vehicles and is administered by the Federal Highway Administration (FHWA). The docks will be like those recently installed in Port Barre, Breaux Bridge, St. Martinville, Loreauville and Charenton. 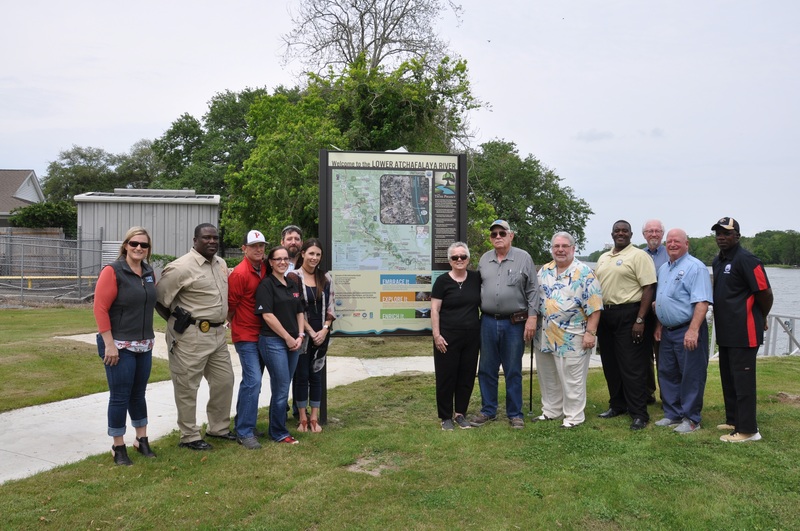 The grant will also fund the installation of large exhibits designed to orient water users and pedestrians to the geography of the Bayou Teche and the unique stories of each of the 15 communities located on the Bayou Teche. 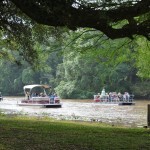 The Bayou Teche is often described as Louisiana’s most historic and culturally significant waterway. The Bayou and its downstream extension via the Lower Atchafalaya River hold the prestigious designation as a National Water (Paddle) Trail. 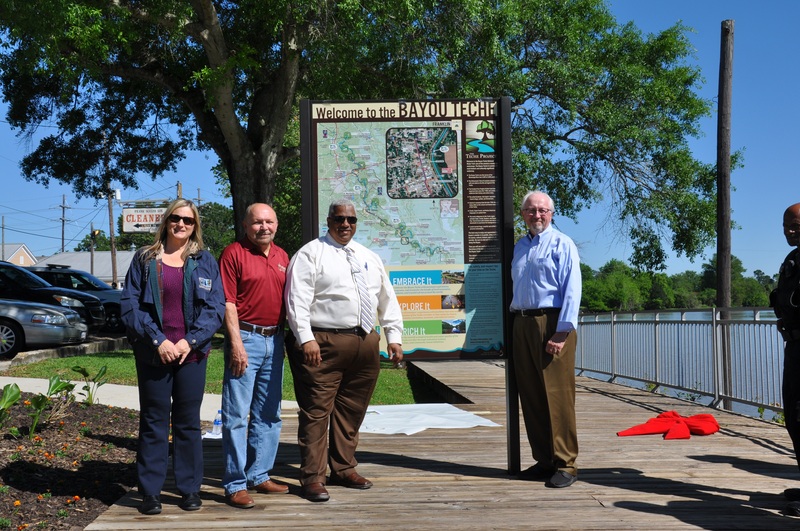 This designation made by the U. S. of Interior in 2015 is only one of 21 such water trail recognitions issued across the United States and the only one ever granted in Louisiana. The next steps for implementing the grant involve securing appropriate permits and arranging for the dock fabrication and installations. Actual installations are expected in the next 12 to 18 months.